Several Nelson and Marlborough properties sold well in winter, including a 500 hectare St Arnaud grazing block sold in April for $2.6 million; a well-established Murchison sheep and beef property sold in May above $3.5 million, and a 147 hectare Kaikoura deer block sold in March above $4 million. In the dairy market, a 93 hectare Murchison farm sold in April for more than $2.1 million. Although uncertainty around Mycoplasma bovis hindered the dairy sector, Marlborough viticulture land and sheep and beef farms remain in demand. Several appealing listings, including increasingly rare large blocks with vineyard potential, will keep the region’s spring market active. Lack of enthusiasm for dairy meant fewer listings than normal on Canterbury’s winter market. Overseas buyers took a spell and vendor confidence ebbed. One approximately 100 hectare North Canterbury finishing farm sold in June for $20,000 per hectare. Potential purchasers of sheep and beef farms are evident, particularly those looking to add 40 to 70 hectare grazing blocks to existing properties. With relatively few listed, those offered have attracted plenty of interest. Several sought after North Canterbury properties will come to the spring market. Values for sheep and beef farms are likely to hold steady. After prolonged low market activity, local co-operative, Westland Milk Products has entered a more prosperous phase, giving West Coast farmers optimism. Late winter purchaser enquiry, including from outside the region, could accelerate by October or November. Entry level farms, around 100 hectares, producing 100,000 kilograms of milksolids annually, and priced between $15,000 and $25,000 per hectare, are available, and compare favourably to other regions. West Coast property is a sensible investment for dairying families seeking to establish younger members. Increased optimism and generational change unleashed after being withheld for a few years should result in spring and summer farm transactions. Plenty of Mid and South Canterbury spring sheep and beef and drystock farm listings should come forward. Although some dairy farmers seek grazing blocks to establish standalone units and protect against Mycoplasma bovis, caution prevails. A few South Canterbury corporate farms went on the winter market, stocking 1,000 cows or more. With overseas buyers no longer as active, superannuation funds focused on diversifying portfolios to horticulture and viticulture and New Zealand-based families capable of large investment limited, purchasers are scarce. Smaller dairy farms offered in spring should sell well, consistent with autumn sales, when top tier properties transacted between $50,000 and $53,000 per hectare. 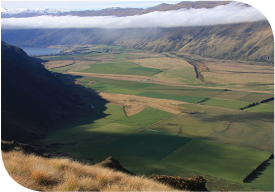 A strong Otago spring rural property market is indicated, particularly for sheep and beef. Several grazing properties from 1,500 to 10,000 stock units will be offered for sale. Favourable commodity prices persuaded many to list, encouraging those considering ending farming careers that now is an excellent time to sell. An enthusiastic and active local gallery of purchasers awaits, generally existing farmers looking to increase scale. With plenty of new listings, the imbalance between supply and demand of Otago rural properties is set to be corrected. As in Canterbury and Southland, caution prevails among Otago dairy farmers. In the region most affected by Mycoplasma bovis, Southland drystock blocks are attracting increased demand. Dairy farmers seeking to improve self-sufficiency by isolating herds were eager to purchase 70 to 100 hectare properties, or lease land, though during calving, the region’s dairy property sector was otherwise subdued. Meanwhile, an $8 lamb schedule, the beef schedule remaining firm, the weakening currency, and interest rates staying low make prospects for sheep and beef farmers excellent. Demand for Northern Southland arable property is high, selling above $25,000 per hectare. Most classes of Southland farm listed for spring sale can expect a positive reception, with current values for capital stock at excellent levels.